We have blogged several times about the importance of flushing little-used outlets as a control measure for Legionella, but it seems particularly appropriate to look at it in more detail at this time of year. While many people are taking some well-deserved time off over Christmas, our clients will be pleased to hear that our engineers are continuing to carry out their flushing duties as normal. This is not just about delivering good customer service; there is clear scientific evidence that supports regular and sustained flushing to control bacteria levels. Indeed, a stop-start approach to flushing is actually worse than no flushing at all. 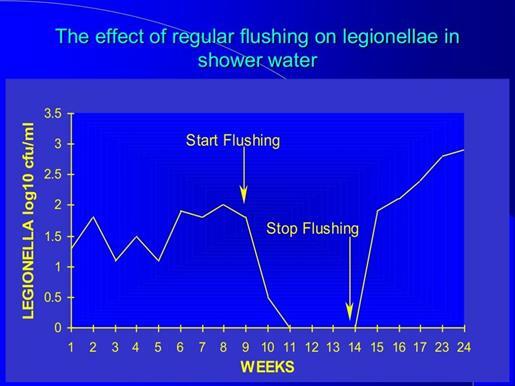 As you can see from the chart above, regular flushing has a dramatic effect on reducing the incidence of Legionella bacteria in a manmade water system. Within just two weeks of the start of a flushing routine, the bacterial count has reduced to zero, and this is maintained easily when weekly flushing continues. However, if the routine is then abandoned the level very quickly – within just a fortnight – grows exponentially, actually increasing to a higher level than that recorded prior to the instigation of the regime. This potentially critical increase in bacteria levels reminds us of the importance of proper record-keeping to ensure that flushing has been carried out at the appropriate intervals but a suitably qualified or experienced person. All too often an outbreak of Legionnaires’ disease is traced back to a lapse in procedures or a break in routine. When you turn on the shower, contaminated stagnant water from the peripheral system (shower and associated dead legs) is displaced by water from the central system; this is the cooler, unwanted water found at the beginning of a shower. Flushed water carries away waterborne Legionella and dislodges biofilm lining the inside of the pipes and fittings, which harbours Legionella. 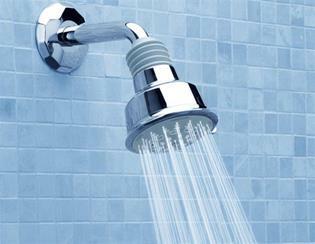 It’s also worth noting that flexible shower hoses carry their own risks, as movement of the hose can disperse infected biofilm into the shower spray, perhaps leaving some residue behind for the next shower user who, when they turn on the water, will be covered in contaminated water. Therefore when flushing a shower with a flexible hose ensure that it is moved around vigorously during flushing to remove any biofilm or bacteria. Ideally you should remove the showerhead to avoid dispersing the water in aerosol droplets, but if this isn’t possible, cover it with a towel or plastic bag. Turn the shower on to its hottest setting. If your showerhead has different flow settings, you should run the water through each setting for several minutes at a time. When flushing taps, run each one for at least five minutes. Turn the water on slowly so you don’t splash it, thus releasing water droplets into the air. If a property has been unoccupied for a week or more it’s important that all the water outlets in the system are flushed for several minutes prior to normal usage resuming. Similarly, managers of rental properties must make sure that flushing is carried out at least weekly during all void periods. This simple preventative measure will significantly reduce the risk of Legionella and help ensure legal compliance.